Welcome to the 2012 edition of the Festive Friday Blog Hop hosted by Terri Sproul. This year, as we did last year, we are hopping the 2nd and 4th Fridays of each month to share Christmas Cards we've made. Hopefully we'll inspire you -- to keep Christmas in your heart all year, AND build up a nice stack of cards you can use when it comes time to celebrate the holidays! I made this card using the Postage Stamp punch on a scrap of retired Designer Paper. I punched 6 squares, then cut one square into 4 triangles. I positioned the punched and cut pieces onto another scrap of coordinating retired DSP creating the look of a Quilt, and then mounted all that onto a piece of Old Olive Card stock. This "quilted" piece was then mounted onto a Real Red card stock base that I had stamped Merry Christmas in Chocolate Chip Ink, from the Hand Penned stamp set. I finished off the card with some white accents using my uni-ball Signo Gel Pen, and a Real Red button from the Designer Button - Brights collection. The bow is scrap embroidery floss. This is an easy card to make using scraps, but also would make beautiful coordinated sets for gifting, using your favorite patterned papers. You could also use it year round - change your color scheme, and swap your sentiment to Love, or Missing You, or Thinking of You... even Welcome Baby! To me, the quilt says home and comfort, making for a card with a lot of warmth. Add this quilted piece to your Scrapbook page, and you've added a special warmth to your layout. Versatile - use it on holiday or baby pages. You can use it as presented here - about 1" squares, or up-size it and create spaces for photos using 4x4" squares. Embellish with faux or real stitching, buttons or bows. Please continue to add to your inspiration as you hop along with us and visit all the lovely blogs participating, but next on the path is BRENDA. Enjoy!! oooh so pretty! love this. This is so pretty! 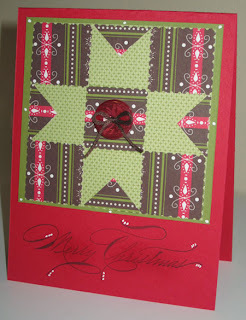 I love the quilt appearance - I do a bit of quilting but my mom is very into it and she would just adore this card too! Cute! Like the idea of a quilted square! Love quilt block card, wonderful patterns. Beautiful quilt Card! love it!